For the first time in a REALLY long time, I had one of the kiddos along for the screening, so this review is in a slightly different format–to give the perspective of the target demographic: a 10-year-old. 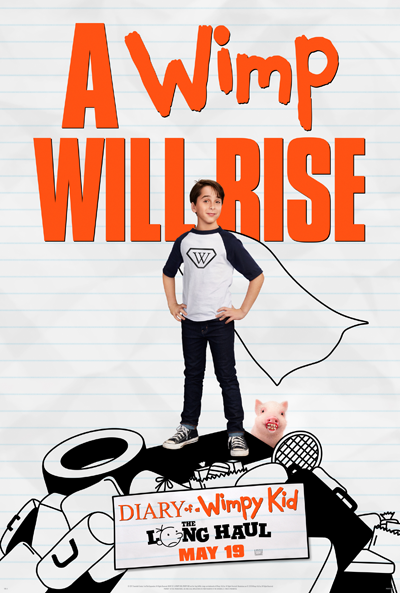 “Diary of a Wimpy Kid: The Long Haul” is another chapter in the life of Greg Heffley (Jason Drucker), a much beleaguered twelve-year-old boy who’s alternately tormented by his overly well-meaning parents and his insufferable, annoying older brother, Rodrick (Charlie Wright). This time, the Heffleys are hitting the road to go halfway across the country for the 90th birthday party of Greg’s great-grandmother, Meemaw (Mimi Gould). The movie opens with the entire family (plus one of Greg’s friends) having a family-friendly dinner at a local restaurant that seems like a cross between a Chuck E. Cheese and a series of unmanaged troughs; this restaurant seems to be all at once the best friend and worst nightmare for the parents of young children. While hunting for his little brother in the overflowing ball pit/swimming pool, Greg manages to get a loose diaper stuck on his hand. The Power of the Internet soon takes over: he’s memed in a heartbeat as “Diaper Hands” and what little rep he has is shredded in the process. What follows the family’s departure from the homestead is a series of gaffes, missteps, and mishaps that alternate between funny and cringe-worthy. Even with some laughs, this movie may make parents reconsider taking a lengthy car trip with the kiddos. Speaking of kiddos, I have a ten-year old with thoughts of her own; my interview and her (only very lightly edited) responses can be found below–as well as both of our ratings. Me: You’ve read “Diary of a Wimpy Kid: The Long Haul”. How do you think this stacks up versus the book: better, worse, about the same…or just different? Remember that not every movie made from a book has to be just like the book; it can be enjoyable on its own, even if it changes a few things here or there. DD: It is definitely different from the book, with a few changes near the end (I won’t give that away). The story is similar to the movie, but overall the book is a little bit more exciting than the movie. If I had to choose between watching the movie again or reading the book, I would choose reading the book because it’s more interesting than the movie. Me: Was there anything particularly good or bad about the movie, such as any scenes that made a particular impression on you? Remember not to give away any spoilers about the ending! The Agricultural Fair. I have been to several Agricultural fairs before, and they were total opposites of this. Normally, they are so crowded you can barely get through, it takes you half an hour to get food, and the rides are so full you only get to go on a few. Not this one; it was WAY TOO open. The booths were miles away from each other, and there was barely anyone there! The lines for the rides were so short, you could probably go to every ride in under an hour. The Motel that they stayed at during the trip was overly gross. It was so UGLY and DISGUSTING. You could see small tiny holes in the bed that were burned. In the bathroom, there were cockroaches all over the floor, and the pool HAD NO WATER IN IT! The only things that were actually IN the pool were mice (or rats) and old wrappers/bags of food. The scenery. It was just gorgeous! The pig. It was SO CUTE! The only thing I didn’t like is that in the book, the pig is in a little bit more than half of it, and in the movie, he/she’s in a small number of scenes. Me: Did you think the actors did a good job portraying their characters? Any standouts–good or bad? DD: I think most of the actors did a good job at portraying their character appropriately and to the age they are set to be. The only mishap I had was with Rodrick. He is supposed to be 16-17 and is acting like he is 19-20. Also, he is supposed to be a crazy teen, but seems more like a teen that is loud and obnoxious. Me: Is “Diary of a Wimpy Kid: The Long Haul” appropriate for kids? If so, what age would be the youngest you’d recommend? DD: I would recommend this movie for kids age 7+. I wouldn’t go any lower, due to a couple of scenes and some language (there are no swears, but even so), I think that it would be a little much for them. I think that kids like me, ages 9+, might like/dislike it based on the books (I have read them all). Me: On a scale of zero to four stars, where zero is “I NEVER WANT TO SEE THIS AGAIN”, and four is “THIS WAS THE BEST MOVIE EVER AND EVERYONE SHOULD GO SEE IT” (and where half stars are allowed), how would you rate “Diary of a Wimpy Kid: The Long Haul”? DD: I would rate this three stars out of four. I don’t like it as much as I liked the book (like I explained in the first question). It was entertaining, but even so, there were some parts that didn’t make me go “WOW!” or “COOL!”; they just made me go, “So…what does that have to do with the story? !” This is just my opinion, but people are different, so you might like it better or worse than I did (depending on your taste of movies). Me: For my part, I’d rate it two stars out of four–but I’m not the target audience; I’m just the money and the ride. Thanks for your help, kiddo! “Diary of a Wimpy Kid: The Long Haul” opens in theatres on Friday, May 19, 2017. It is rated PG for some rude humor. This entry was posted in movie reviews, Uncategorized and tagged diary of a wimpy kid, jeff kinney, movie review, movie reviews, the long haul by crunchymetromom. Bookmark the permalink.